Unfortunately, like most of you, Bob and I are forced to contend on a day-to-day basis with the same sort of issues most of you face. We have careers. We have families. Spending an additional 16-24 hours each and every week writing and drawing comics is no easy task. We love doing it but, especially for me, the schedule has begun to take its toll. So, Bob and I have found ourselves at a bit of a crossroads. Do we stick to the publishing schedule and watch the quality of the comics decline because we are too exhausted to give each strip our best effort; or, do we reduce the number of comics we publish, give ourselves a chance to recharge and focus on making each comic the best it can be? I think it’s safe to say that we’ve learned a lot about storytelling, humor and comics over the past year. While we are by no means experts, after writing and drawing 159 comic strips, one thing has become apparent: there is no magic formula for crafting a good comic strip. Sometimes? Writing and drawing a great comic is effortless. Everything clicks into place and, before you know it, it’s done. Other times? Writing and drawing a great comic is a grind. There are no easy answers, nothing seems to work right at first and there is nothing to be done about it but to work through it or, if the concept really isn’t working, to abandon it and start over. I think it’s safe to say that both Bob and I would love it if we could do Haiku Comics as a full-time job but, for the foreseeable future, the most apt description of the project would be hobby. And as hobbies go, Haiku Comics is pretty demanding. When the comic goes through a rough patch and Bob and I have to struggle to get a concept to work, the process can really start to wear on us. For me, it’s meant drawing comics at 3am and forgoing sleep. It’s meant spending Saturdays catching up on work rather than spending time with my wife. It’s meant working through holidays and scrambling to build up archives before vacations. Look, you’ve got to be a little crazy to do comics. We’re okay with that. Haiku Comics is a labor of love and neither of us plans to abandon the project any time soon. However, there are limits, you know? When we started Haiku Comics, Bob and I agreed to publishing three comics a week for a year. It seemed to us that a full year would really give us an opportunity to learn how to make good comics, give us a chance to build an audience, and give us the full experience of of being comic strip authors. And it has. And we’ve met that goal. It’s really been an incredible year, one made so much better by each and every one of you reading this. It has been humbling to know how much you all have been enjoying our comic and how much you look forward to reading each new comic strip. We really do our best to give you our best work and we want to make sure that we continue to give you our best work in the future. In order to keep our sanity in 2010, Bob and I are changing Haiku Comics to a flexible schedule. Comics will still publish on Mondays, Wednesdays and Fridays, but just not every Monday, Wednesday and Friday. For the next couple of months? We will probably only be publishing about one comic strip a week. And that comic will publish on a Monday, Wednesday or Friday. 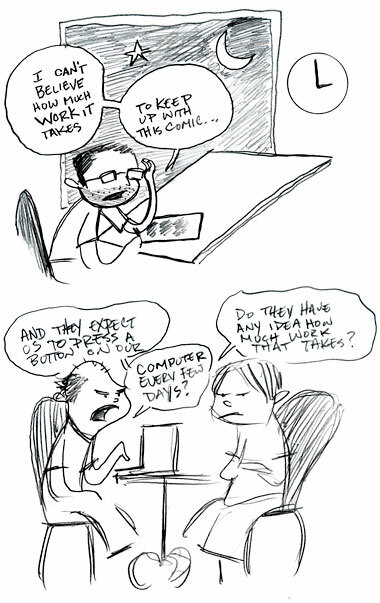 However, we are open and willing to publish more often if we hit a series of “easy” strips. If the stars align? The seas part? The angels light the way? Three strips a week it is. We would both like to commit to a more structured schedule, even if it is reduced, but the problem is that we don’t know what kind of structured schedule will work. And I, unfortunately, really do have some other work that needs to take priority for at least the next couple of months. But there may eventually come a time when we announce some sort of fixed schedule once we figure out what we’re able to do. We’ll let you know. So, with this new schedule, how will you, the reader, know when we’ve published a new comic? My recommendation would be to check out Google Reader. Google Reader is free and it’s a great way to keep track of all of your favorite web comics, as well as any other blogs that you follow. Google Reader will notify you whenever we publish a new comic or announcement and allow you to view it right as it happens. You can also follow me on Twitter. I haven’t made it a policy in the past to announce when each and every comic has been published but, since we are moving to this new “hippy” schedule, I will make a point to do so in the future. It’s also possible for us to create an email list, if there is sufficient interest. We would only use the email list for announcing when comics publish and we would never give out your personal information to anyone. If an email list interests you, please leave a comment on this post and we’ll use that as a means of gauging interest. Thank you all so much for making 2009 such a great year for Bob and I. I hope you will all be patient with us in 2010 and stick with Haiku Comics. We want to give you good comics and we want to give you as many of them as we can. We have some great things planned. Stay tuned! I’d appreciate being on a e-mailing list letting me know when a new strip comes out. Man, doing 3 strips a week, for a year, I figured that had to be grueling. An impressive effort, though. I understand you guys are… exhausted and (gasp)…have real (outside of the comic realm) lives to maintain, but geesh (argh), …the Haiku Comic “every other day” withdraws (whine)… are goina be harsh (ouch). I’m…I’m getting the shakes already (rattle). But that’s okay…I’ll be alright (AAIIEE!! OH MOTHER OF GOD TAKE THIS PAIN AWAY!!!). I’m not quite up to the 1 year mark yet as you guys are, but I can relate to the pains that you describe.. Damn day jobs get in the way! At any rate, congratulations on where you are. Haiku comics definitely break away from the cut and paste comics out there. I wrote a single rip off homage to haiku comics that I haven’t published and it was a nightmare. I don’t know how you guys pull it off but I congratulate you for it. “flexible schedule” is a mistake. Cutting back is okay, but you still need to have a set schedule. I’ve stopped reading lots of comics because unpredictable updates get too frustrating. If you can manage one a week then just pick a day. If you get ahead and want to throw in a few “bonus” strips, more to the good. Seriously, though. I’d appreciate a mailing list for updates so that I don’t have to check back every day. As disappointing as this “scheduling change” is to me, I totally understand, and I’m just glad you guys aren’t retiring all together. I set-up an email notification list in the right-hand sidebar. It’s nothing fancy. When there’s a new comic? It’ll shoot you an email. You won’t hear from us otherwise. Just because you’re funnier than me doesn’t mean I’m not right about the set schedule. Good luck and congrats on a great comic. You do have a point and we even discussed it after bringing it up. Sure, it is a little harder on our readers with a flexible schedule, but I know of quite a few comics that have a flexible schedule that I keep track of. Hopefully we haven’t alienated you as a reader and we do have an email list now that is only used to send you an email when a new comic is up. However, if you decide to move on, both Nathan and I do thank you for the time you have invested in the comic. I’m not leaving. My post was not some “take my ball and go home” threat. Your current readers probably all love it enough to keep coming back, but new readers may be more difficult to grab with an uneven schedule. Well, you know, there’s a special section of hell reserved for people like that — and it’s a library filled with Garfield collections. You guys have moved mountains in 2009 with this comic strip! I look forward to your raving etchings and warped humor with great anticipation whenever they appear. Funny sketch of you in the wee hours slaving to keep up with the brutal schedule, by the way.